The current nomenclature or name used for various biofuels can be misleading and/or confusing to the average person, and even to a trained personnel in the field. A cursory review of the literature clearly shows that different terms are used to describe the same type of fuel; conversely, one term may be used to describe different fuel types. For example, the terms biodiesel, second generation biodiesel, Fischer-Tropsch (FT) renewable diesel, HVO (hydrotreated vegetable oil), green diesel and renewable diesel have been used interchangeably for fuels resembling petroleum diesel and derived from biological sources. 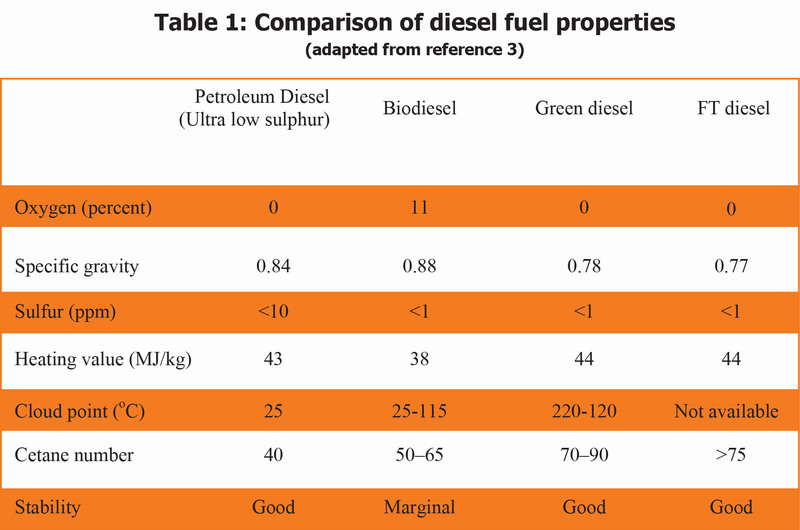 The objective of this factsheet is to highlight the differences among the diesel fuels derived from renewable resources and produced by using different processing techniques. A diesel engine, also referred to as a compression-ignition engine (CIE), is an internal combustion engine that uses the heat of compression to ignite the fuel injected into the combustion chamber. Whereas, fuel is ignited by a spark plug in a spark-ignition engine such as a gasoline engine. As the name implies, a diesel engine runs on diesel fuel and has a higher thermal efficiency than a spark ignition engine. Petroleum diesel, which is a very complex mixture of straight-chain and branched alkanes and aromatic compounds, is widely used in CIEs. Hexadecane (cetane) is the reference compound used to assess the ignition quality of a diesel fuel on the cetane scale, a concept similar to the octane number used for gasoline. The carbon chain length of the alkanes present in diesel fuel determines the cetane number. Diesel fuels containing large amounts of shorter-chain and isomerized species have lower cetane numbers while diesel fuels consisting mainly of long-chain alkanes have higher cetane number. ASTM D975 and EN 590 are the commonly used petroleum diesel standards in the United Stated and Europe, respectively. In general, vegetable oils consist primarily of triacylglyceride molecules. Low concentrations (<2 percent) of free fatty acid (FFA) molecules are also present in vegetable oils. Both triacylglycerides and FFAs contain relatively long, linear aliphatic hydrocarbon chains, which are partially unsaturated and have a carbon chain length and molecular weight similar to the molecules found in petroleum diesel. Hence, the cetane number of diesel fuels derived from renewable resources such as vegetable oils is high, over 70. Long-chain alkanes are less desirable because of their adverse effects on low temperature properties of diesel fuels. Shorter-chain compounds improve cold flow properties of diesel fuels. The advantages of vegetable oils as fuel include high heat content (about 88 percent of No. 2 petroleum diesel fuel), lower sulfur and aromatic contents, biodegradability and being derived from renewable sources. High viscosity of vegetable oil (28 to 40 mm2/s), 10 to 20 times greater than petroleum diesel, is a major problem associated with the direct use of vegetable oils as fuels in CIEs. Low volatility and high viscosity of vegetable oils impede complete combustion and lead to the formation of deposits in the fuel injectors of diesel engines. Vegetable oils and fats can be modified to improve their performance in CIE. Pyrolysis (cracking), hydrodeoxygenation, dilution with hydrocarbons (blending, emulsification) and transesterification processes produce diesel fuels with improved engine performance. Each process yields fuels with different chemical compositions and properties. Biodiesel has several disadvantages including low fuel storage stability, poor cold flow properties in winter climates and excessive solvency that can lead to engine compatibility issues. Dilution of vegetable oils and biodiesel with ethanol, petroleum diesel and solvents such as Stoddard solvent (48 percent paraffins and 52 percent naphthenes) has been tested to mitigate the problems associated with high vegetable oil viscosity. However, these blends still may cause injector plugging and low engine performance issues. Research and development work in this field is still ongoing. Microemulsions are thermodynamically stable dispersions of two immiscible liquids containing appropriate amounts of surfactants. Microemulsions have been tested as low viscosity fuel blends containing substantial quantities of vegetable oil. However, fuels formulated as microemulsions have low cetane numbers and low heating values as compared to No. 2 diesel fuel. Viscosity of the hydrocarbons depends on the carbon chain length. Pyrolysis process, also referred to as thermal cracking, reduces the hydrocarbon chain length and consequently reduces viscosity. Thermal cracking of vegetable oils requires relatively high temperatures (250 to 350°C) and heating rates. The product resulting from thermal cracking and pyrolysis oil needs to be distilled to obtain renewable diesel with properties resembling those of petroleum diesel. Recently, an ASTM standard (D7544) for pyrolysis oils was issued. One of the chemical composition differences between petroleum oil and vegetable oil is the oxygen content. Vegetable oils contain 10 to 12 percent by weight oxygen, whereas fossil fuel normally contains insignificant amounts of oxygen. The oxygen content adversely affects both the specific energy and combustion properties of the oils. The hydrodeoxygenation process saturates the double bonds with hydrogen and removes oxygen from the triaclyglyceride molecule or vegetable oil. This process is also referred to as decarboxylation, decarbonylation or dehydration. Hydrogenation of carboxylic groups requires temperatures in the excess of 300°C. The product resulting from the hydrodeoxygenation process is HVO, green diesel or renewable diesel. The UOP/Eni EcofiningTM process (see reference 3) produces green diesel. Green diesel is a paraffin-rich, fully deoxygenated diesel fuel that burns cleanly. Similar to biodiesel, green diesel is produced directly from natural oils and fats and provides significant benefit as an alternative fuel with respect to greenhouse gas emission reduction. The UOP process allows lower cost materials such as tallow oil and waste greases to be used as feedstock. In contrast to biodiesel, whose fuel properties depend on feedstock chemical composition, green diesel properties are independent of feedstock and cold flow properties and can be controlled by adjusting the process conditions. Green diesel has similar energy content, lower density and higher cetane number than petroleum diesel. Biomass can be gasified to produce biosyngas that is rich in hydrogen and carbon monoxide and can be converted to liquid fuels. Biosyngas is different from syngas, which is produced from feedstocks of fossil origin, and from biogas, which is produced by digestion of organic matter. Syngas consists mainly of methane and carbon dioxide gasses. During the Fischer-Tropsch (FT) synthesis, syngas is used to produce long-chain hydrocarbons that are converted into syndiesel. FT synthesis can also be used to convert biosyngas to renewable diesel. Second-generation biodiesel usually refers to the biodiesel derived from alternative feedstocks such as inedible oils or algae. It has been argued that utilization of the term second-generation might be misleading since the second-generation reference might imply that diesel fuel derived from such feedstocks may have superior fuel properties, which is not necessarily the case. From a historical perspective it is appropriate that the term biodiesel is used for mono-alkyl esters of fatty acids. However, it is important to keep in mind that although vegetable oils and animal fats come from renewable and biological sources, methanol, which is the alcohol of choice for biodiesel production today, is usually derived from fossil sources. Thus, references to “bio” and “renewable” are usually based on the primary feedstock. Utilization of the term “green” is more controversial since it is not clear if the reference to “green’ implies that the fuel itself is ‘‘greener’’ than petroleum diesel in terms of its effect on greenhouse gases and biodegradability or because the feedstock comes from a renewable source. It appears that “renewable diesel” is an appropriate term for petroleum diesel-like fuels derived from biological sources. American Society for Testing and Materials (ASTM) standard D7544. Standard specification for pyrolysis liquid biofuel. West Conshohocken, PA: ASTM. Gerhard Knothe. 2010. 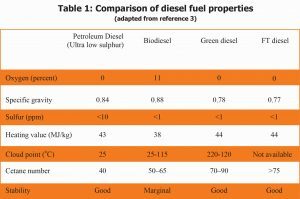 Biodiesel and renewable diesel: A comparison. Progress in Energy and Combustion Science 36: 364–373. Tom N. Kalnes, Ken P. Koers, Terry Marker, and David R. Shonnard. 2009. A Technoeconomic and Environmental Life Cycle Comparison of Green Diesel to Biodiesel and Syndiesel. Environmental Progress & Sustainable Energy. 28(1):111-120.